Genetically modified granular cells of the olfactory bulb in a mouse. The nuclei of the granular cells have been marked red by immunohistochemical staining. Cells that express an additional protein through viral gene transfer are green or yellow (see arrows). The virally expressed cre recombinase can modify the genetic material highly specifically in genetically modified mice. In the case presented, a certain glutamate receptor was removed from a large portion of the granular cells in this way, which resulted in the increased inhibition of the output cells of the olfactory bulb, leading to accelerated discrimination of odors. Source: Institute of Anatomy and Cell Biology, Heidelberg University Hospital. Whether different odors can be quickly distinguished depends on certain synapses in the brain that inhibit nerve stimulation. 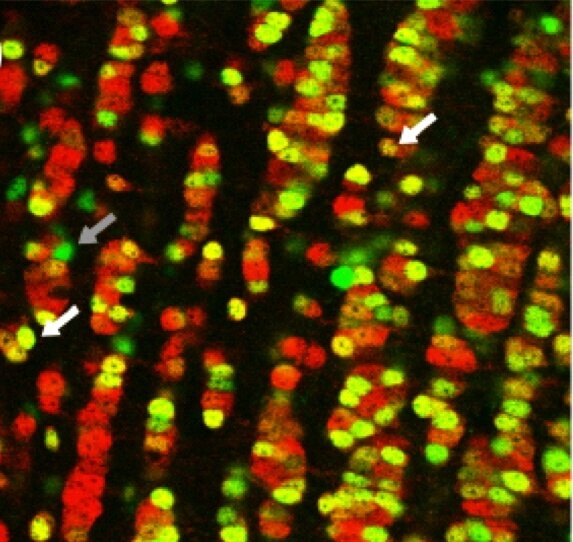 The researchers in Professor Dr. Thomas Kuner’s team at the Institute of Anatomy and Cell Biology at Heidelberg University Medical School and Dr. Andreas Schäfer at the Max Planck Institute for Medical Research have shown that mice in which a certain receptor in the olfactory center is missing can distinguish similar smells more quickly than mice without genetic manipulation. This behavior was directly attributed to inhibitor loops between adjacent nerve cells. The discovery of the activation principle of “lateral inhibition” in the eye 43 years ago by Haldan K. Hartline, George Wald, and Ragnar Granit was honored with a Nobel Prize. The Heidelberg researchers have for the first time succeeded in confirming the same mechanism for the olfactory system, from the molecular level to behavior. The results of the studies were published in the prestigious journal “Neuron”. Odors attach to receptors of olfactory cells in nasal mucosa, where they trigger nerve signals. These signals are processed in what is known as the olfactory bulb, a part of the brain. In the neuronal network, the incoming signal is converted to a specific electrical pattern that is transmitted to the cerebral cortex and other areas of the brain and is recognized there. Professor Kuner and his team have now shown for the first time how neuronal processing of olfactory stimuli directly affects the behavior of test animals. “We manipulated information processing very specifically in the olfactory bulb and then measured the effect of this genetic manipulation based on reaction time. We were thus able to prove that the test animals, due to localized inhibitor loops, could distinguish very similar odor combinations much faster, yet very reliably,” explained Professor Kuner. Inhibition via interneurons acts as a kind of filter by amplifying strong stimuli and further weakening weak stimuli. This makes the essential information easier to recognize. In the test animals, reaction time was reduced by about 50 ms. The time needed by test animals to learn various odors and their memory capability remained unaffected. Recognition of simple odors was also unchanged. 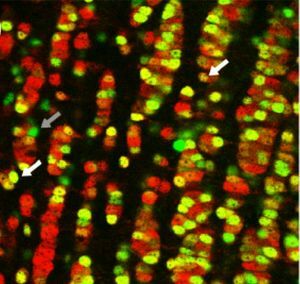 The researchers delivered a certain enzyme, cre recombinase, directly into the nerve cells of the olfactory bulb of young mice via a viral gene ferry. In the genome of these mice, a certain gene segment was removed using genetically introduced recognition sites of these enzymes. This led to the deletion of a receptor in the interneurons. This targeted manipulation made the inhibitor loops especially active. Using the usual “knock-out” models, in which the gene is deactivated in the entire body, the subsequent selective behavior could not have been observed. In a sophisticated experimental design, the mice then had to learn to recognize simple and complex odors composed of several aromatic substances. Using electrophysiological measurements, imaging processes, and anatomical techniques, a link was then created from the molecule to behavior.